Every four years, the world’s attention turns toward the spectacle of the Olympic Games, and the eternal symbol of the Olympic flame burning for the duration of the Games. Symbolizing Prometheus’ theft of fire from Zeus, the Olympic torch is one of the world’s best-known cultural icons. However, the use of the torch is a relatively new development, having made its debut in the 1928 Summer Games in Amsterdam. Great spectacle and ceremony mark the journey of the torch from its ceremonial lighting at the ruins of the Temple of Hera in Olympia, Greece to its destination at the Olympic cauldron to open the Games. To light the torch, an actress portraying a high priestess holds an unlit torch above the center of a large, bowl-shaped mirror. The concentration of the sun’s rays at a central point in the mirror generates enough heat to light a flame on the torch. The flame is then passed to the first of the torchbearers in a relay toward the destination of the games, symbolizing peace and brotherhood for the duration of the competition. Keeping the Olympic flame alit from torch to torch along the relay, however, relies in part on propane. As the design of the torch has evolved over the years, a combination of technology and fuel sources have come together to produce a torch that preserves the Olympic flame along every step of its journey. The current design of the torch utilizes a double burner flame, with the larger, more visible flame outside surrounding a smaller internal flame that acts as a pilot light should the larger flame be blown out. This years’ torch is constructed primarily of aluminum and is weighted and counterbalanced to make it comfortable to carry. The fuel container within the torch handle for the 2014 Sochi Olympic Games contains environmentally-friendly propane, produced in Russia. This fuel container holds enough propane to fuel the torch for approximately 15 minutes. 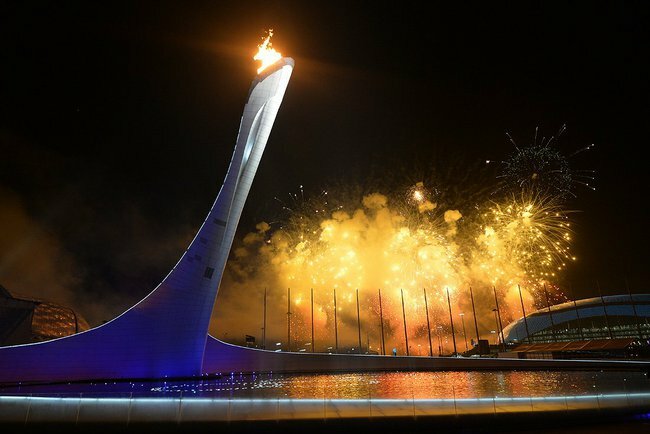 When Russian hockey great Vladislav Tretyak and pairs skater Idrina Rodnina touched the final torch in the relay to the Olympic cauldron at Sochi, the flame had traveled at the hands of nearly 14,000 torchbearers, spanning 100 days and over 40,000 miles. And thanks to propane, the flame never went out along its journey.